Nutri YOG Peanut Protein is 100 % Plant sourced and cholesterol lactose , Gluten, Soy, dairy free. Peanut protein is high quality Plant Protein, choice of vegan and vegetarians. It contain all Essential amino acids which cannot be made by the body, and must be supplied by food. our body can not synthesize and required for proper functioning of all physiological process of growth and development of human body. Nutri YOG Peanut Protein Powder Supports your weight management and fitness goals. It provides building blocks to muscle growth for fitness of body and activates energy releasing metabolism. The digestion and assimilation of peanut protein favors proper health, strength and active immunity in all individuals. 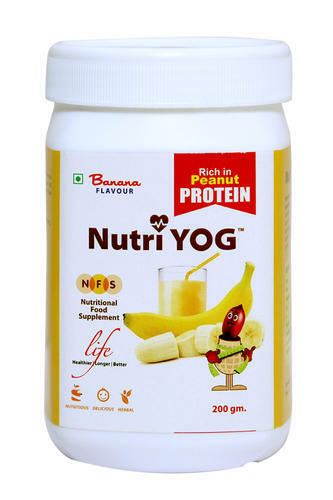 Nutri YOG Peanut Protein Powder is suitable for children, pregnant / lacting women, sports persons, undernourished and elderly persons and also recommended for pregnant lacting mother as it is a healthy way to maintain their daily nutrition. As per global standard established by WHO for Protein Digestibility Corrected Amino Acid Score(PDCAAS) , A score of PDCAAS 1.0 represents the highest score possible for a quality protein source while The PDCAAS for Peanut protein has been estimated to be about 1.0 and its true digestibility is 94 % which is highest score other grains Soya, Whole Wheat, Maize. Blend or Stir 2 scoops (approx. 30 grams) of Nutri YOG Peanut Protein Powder with 240 ml of skim/toned milk and enjoy! Take mid-morning and/or mid-afternoon to help meet your daily protein requirements . "Nutrinity Foundation”, founded in the year 2012, is a well-known firm, engaged in manufacturing, exporting and supplying of quality Peanut ingredients (Roti booster, Peanut Protein Powder, and Peanut Granules) to food industries worldwide. We have a wide and well functional infrastructural unit situated at Junagadh (Gujarat, India) and helps in making a premium quality range of products as per the set food industry standards. We offer our product under the brand name of "Nutri YOG". Our company is known among the customers for its ethical business practices, punctual delivery and strict quality standards, we have satisfied our customers by presenting them healthy, hygienic and 100% pure customized products as per demands and needs at market leading prices. This is possible for us due to our sustained R & D and the consistent support of our experienced and skilled professionals.